We, Gujarat based Dev Enterprise, established in the year 2013, are one of the topmost manufacturers of a broad variety of optimum quality Door Handles, Door Kit and many more. The product range offered by us consists of Cabinet Handles, Curtain Brackets and Door Magnets. Our designers design these door hardware and accessories from quality assured stainless and in accord with the latest market trends. Moreover, the door hardware and accessories offered by us are available with us in all the standard pattern, sizes and grades. Known their eye-catching design, perfect finish, resistance to corrosion and alluring appearance, these door hardware and accessories are highly demanded in the market. For the ease of our customers, we accept different modes of payment. For ensuring that the premium quality of the offered door hardware and accessories is never compromised, we have set up a huge in-house quality testing unit. 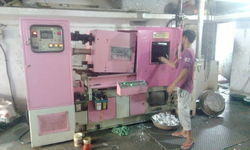 With the aid of our large production capacity, we have been able to meet the bulk orders. Customer centric approach and ethical business polices has helped us in catering to the precise needs of our valuable customers in the most efficient manner. We have been able to deliver the offered door hardware and accessories within the assured time frame at the clients’ end. Established by our proprietor, Mr. Dharmesh Bhai, we have been able to cater to a huge clientele across the globe. He with his experience has helped us in winning a commendable position in this domain. Our team, under the supervision of our proprietor, Mr. Mehul, is appointed after completely assessing their experience, knowledge and skills. They are appointed through various procedures conducted by our management. In addition to this, our workers work in close proximity with each other. For enhancing their skills, our employees at Dev Enterprise are trained at regular intervals of time. Our team at Dev Enterprise works in close coordination with each other to avoid any kind of hassle in the workplace. Being a quality conscious, we at Dev Enterprise ensure that best possible quality of the offered door hardware and accessories is never compromised. For this, we under the leadership of proprietor, Mr. Mehul, have set up a huge in-house quality testing unit. Our in-house quality testing unit is well-equipped with latest testing tools and it is known for carrying out standardized operation. Moreover, the quality of the offered door hardware and accessories is maintained through various quality assurance checks. For delivering the offered door hardware and accessories within the assured time frame at the clients ‘end, we have established a vast distribution network. At Dev Enterprise, under the Mr. Mr. Mehul, we have implemented different customer-driven approaches and followed various ethical policies. At dev enterprises, we believe that by providing our customers with quality assured range, we can set up a long-term relationship with our clients. Customized solutions and hassle-free modes of payment are offered, keeping in mind the convenience of our clients.